The special prosecutor’s investigation into admissions fraud surrounding Chung Yoo-ra, the daughter of President Park Geun-hye’s close friend, is reaching its final stage, with a court reviewing Tuesday the arrest of the school’s former president. 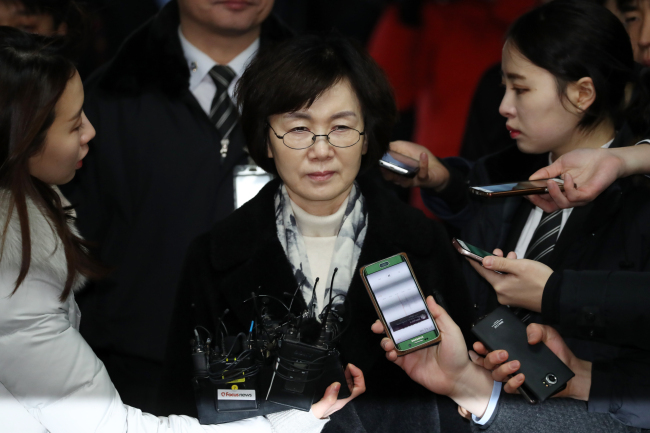 Choi Kyung-hee, president of Ewha Womans University until October, attended a hearing for her arrest at the Seoul Central District Court over suspicions that she directed professors and school officials to accept Chung. In return for admissions favors for Chung, the probe team alleges the elite school received state subsidies and projects via her mother Choi Soon-sil, President Park’s close friend accused of meddling in state affairs. The former university president is also accused of perjury, having denied during a parliamentary inquiry last month that she has never met Choi Soon-sil personally. The probe secured records of dozens of phone calls between the two in the year Chung was admitted. If arrested, Choi will be the fifth and highest official of Ewha to face the ordeal with regard to the 20-year-old horseback rider Chung. The court’s decision on her arrest was not available as of press time. It is expected to be announced late Tuesday or early Wednesday. The investigative team led by Special Counsel Park Young-soo has been looking into allegations that Chung was illegally admitted to Ewha and received special favors in grading despite her missing most of the classes as part of its high-profile, multifaceted inquiry into a massive corruption and influence-peddling scandal that led to the impeachment of President Park late last year. Four have been already arrested, including former dean of the university’s College of Science and Industry Kim Kyung-sook, former head of admissions Namkung Gon and Professor Lyou Chul-gyun. Chung is currently under the custody of Danish authorities. The probe team also expects to bring her home for questioning through the official extradition process, which Chung seems determined to resist. Repatriation could take several months, should Chung file a petition against the Danish court to avert repatriation. Besides special treatment in school, the “equestrian princess” holds key to another allegation in the sweeping scandal that ties her mother Choi Soon-sil to South Korea’s top conglomerate Samsung Group. Executives of the group, including its de facto chief and Samsung Electronics Vice Chairman Lee Jae-yong, are under investigation that they provided generous sponsorship to Chung and Choi’s sports business interests in return for the Park administration’s support of the group’s merger of two units.